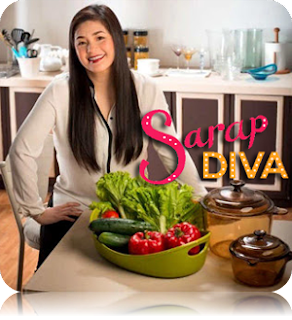 Jessica Soho, meanwhile, displays her other passion aside from delivering the news as she treats Regine with her rich Ilocano specialty: Pinakbet. Pinakbet or pakbet is a popular Ilokano dish, from the northern regions of the Philippines, although it has become popular throughout the archipelago. The word is the contracted form of the Ilokano word pinakebbet, meaning "shrunk" or "shriveled". 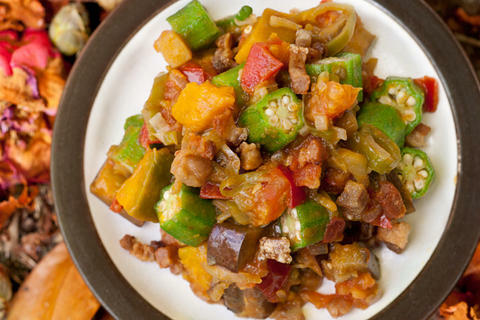 The original Ilokano pinakbet uses bagoong, of fermented monamon or other fish, while further south, bagoong alamang is used. 1. In a cooking pan, heat oil and fry the pork until brown, remove the pork from the pan and set aside. 2. On the same pan, saute garlic, onion, ginger and tomatoes. 3. In a casserole, boil water and add bagoong. Add the pork in the casserole and mix in the sautéed garlic, onion, ginger and tomatoes. Bring to a boil and simmer for 10 minutes. 4. Add in all the vegetables and cook until the vegetables are done, careful not to overcook. 5. Salt and pepper to taste. Serve hot with plain rice.